There is 16 adhesive electrodes for the Slim UP® ULTRA electro-stimulation function as part of the series of treatments. Modulated, bidirectional square wave current maintains and improves tone even in the most difficult areas. The use of specific frequencies and programs developed from the most recent research in this sector, makes it possible to work on large, deep muscle groups for shaping as well as on the thin superficial and subcutaneous muscle groups, for improving the loose skin tone. The analgesic and muscle-relaxing effect of the infrared rays and ultrasound waves make the Slim UP® ULTRA current very gentle and subtle, minimising any discomfort during treatment. The precise, rational association of several synergistic actions makes it possible to concretely deal with fat and cellulite, by improving skin tone while harmoniously shaping the body. Why Increase Tone in Muscle? Muscle toning will raise your basal metabolic rate. What this means is that your body will burn more energy per day, promoting effective weight loss. Muscle toning will also promote strong bones and decrease the risk of osteoporosis. Improving muscular tone will increase endurance and strength, which will allow you to perform common daily activities with less effort. No! The electric impulses are not concentrated in one specific point, but evenly distributed across the surface of the electric pads. There are no painful hotspots conveying sharp kicks. The intensity is adjusted your comfort. Yes! 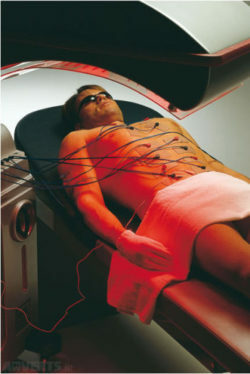 Electro-stimulation uses low frequency current to stimulate the muscles. It is not only safe, but extremely efficient, as 90% of the muscles are involved in the workout. Electro-stimulation is not "shocking" you, it's contracting your muscles. No! The low-frequency impulse exclusively activates the striated skeletal muscles. Organs and the heart and other muscle tissue are not reached. Electro-stimulation must not be used in those with epilepsy or on people who wear a pacemaker. In addition, stimulation must never be applied around the stomach area in women who are pregnant, or for people suffering from a hernia.